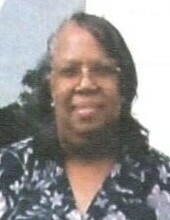 Vera Ward (Mrs. Vera) Lee was born to the late John H. Ward and Amanda Barney Jackson Ward on December 11, 1946 in Mt. Sterling, AL. Three brothers, Willie C., Jessie and Johnnie L. Ward preceded her in death. Mrs. Vera graduated from Choctaw County Training School. She confessed her belief in Our Lord and Savior Jesus Christ at a young age. She joined St. Mark C.M.E Church in Lisman, AL where she served as the Stewardess and Missionary (President of both). Mrs. Vera was a faithful member and served in many capacities for years until her health failed and was unable to serve in the church. Mrs. Vera was united in holy matrimony to Willie Earl Lee, Jr. on September 19, 1970. To this union, Patrick LeShaun Lee and Willie Earl Lee, III, whom preceded her in death, and Alma Amanda Lee were born. Mrs. Vera was a hardworking lady that has worked various jobs ranging from a cashier at One Stop, Substitute Teacher at Lisman Jr. High School and a cook at Piggly Wiggly. However, she mostly worked at Bent Creek Hunting Lodge until her health declined. Mrs. Vera was known for “how strong she was” and for “having a spirit for helping others”. She departed this life on February 10, 2019 at Hospice of West Alabama in Tuscaloosa, AL. She leaves to cherish her memory: her daughter, Alma Amanda (LeMicki) Jones, Tuscaloosa, AL; sister, Lillie (Andrew) Brown, Lisman, AL; Brothers: George and Tony Ward, Lisman AL; Tommy Lee Coleman, Cleveland, OH; Belove Harbin, Lisman, AL; Daughter-n-law, Madelene Lee; Grandchildren: Brittney, Chavona, Patrick Lee, Jr.; Great-grandchildren: Isaiah, Zamya, Dakota, Amare’, MeLani; Sister-n-laws: Essie Ward, Faye Ward, Ethel Mae Johnson (sister), Myra Jackson, Barbary Chaney, Hazel Adams, Mary (George) Minor, Mary Ann (Kenny) Beckham, Chris (Edward) Toodle, Beverly; Brother-n-laws: George (Ertha) Adams, John (Shannon) Adams, William Adams and a host of nephews, nieces, other relatives and friends.